It is with great honor that Syndicate presents O.G. Vans team rider, Wade Speyer's exclusive Syndicate pack this fall. 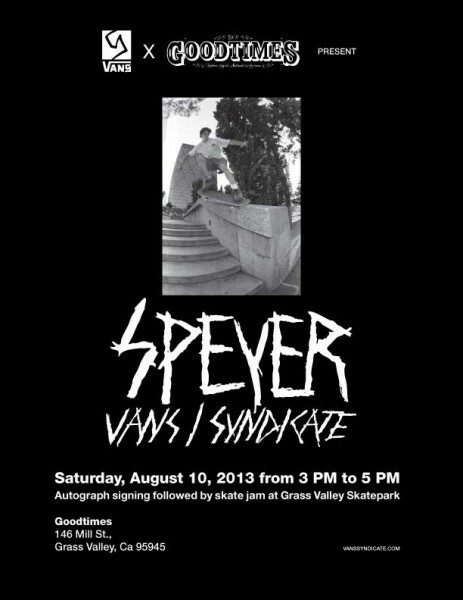 There will be a special autograph signing followed by a skate jam this Saturday, August 10 at Grass Valley Skatepark. See flyer below for more details. In the Nineties, Wade Speyer was a pioneer among a new generation of skateboarders that gave rise to the likes of Vans legend John Cardiel [Wade is Cardiel's all-time favorite skateboarder] and continues to this day in the all-terrain terrors of Tony Trujillo and his ilk. Equally at home skating transitions as he was out in the streets, Wade's path of destruction led to the first documented trick on S.F. 's infamous Hubba Hideout (R.I.P.) and multiple covers of Thrasher magazine, seemingly every other month, until it all ended abruptly, and too soon for those of us here at Syndicate, when Wade chose to walk and not fade away. Wade decided to work with two classically inspired silhouettes, the Sk8-Hi '91 Pro "S" and Sk8-Low "S", with Wade's signature flannel-printed linings and custom graphics package. Visit vanssyndicate.com for nearby retailers.